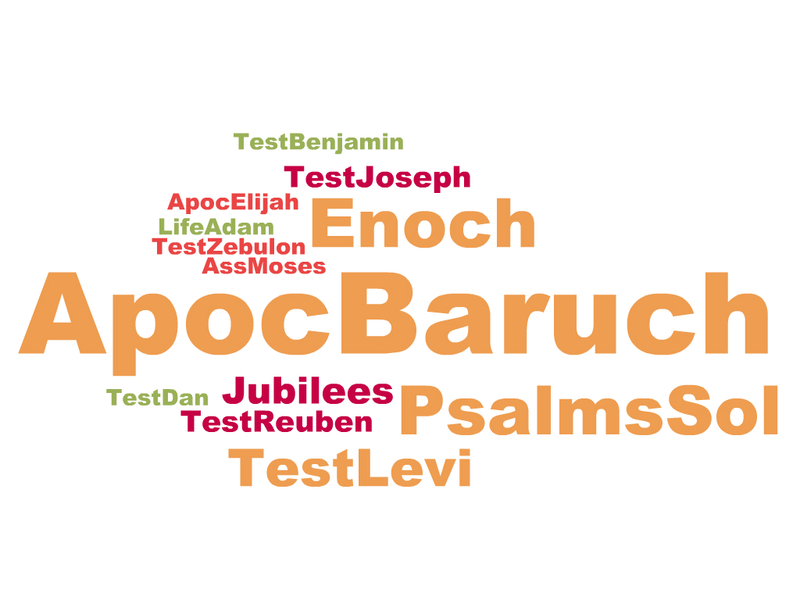 Our last wordcloud explored Paul’s use of the Tanakh (Hebrew scriptures) and identified which of them he used (quoted or alluded to) the most. To most people, the idea that Paul was well versed in the Jewish scriptures is nothing new. After all, Luke (22:3) refers to Paul’s Pharisaic training under Gamaliel; one of the foremost leading teachers of the Law. Although Paul does not mention Gamaliel, he does refer to his Pharisaic experience (Phil 3:5) and his fervent religious commitment (Galatians 1:14 and 2 Corinthians 11:22). It is therefore not at all surprising that a person coming from that background would naturally express himself through the Jewish scriptures. However, Paul’s use of Jewish religious texts was not limited to those found within the Tanakh. The influence of a later group of religious writings (often referred to as the ‘Apocrypha’ or ‘Deuterocanon’) can also be found reflected in is letters. These are the books or parts of books which were included in the Septuagint (the Greek translation of the Hebrew scriptures) but were not part of the Hebrew tradition upon which the later Masoretic text is based. The recognition that not just the sacred texts of the Tanakh influenced Paul’s thoughts and teaching but that he was also influenced by contemporary Jewish intertestamental literature is extremely helpful in helping us to place Paul within his Jewish milieu. It also helps us to understand some of the language and concepts found in his theology and teaching. Paul is traditionally viewed as a Hellenistic Jew being born outside the Palestinian region. Although (again!) Paul makes no reference to it, Luke clearly wants to emphasise (Acts 9:11, 21:39, 22:3) Paul’s diasporic origins, noting that his birth place was Tarsus (in modern day Turkey) and frequently mentioning his Roman citizenship (Acts 16:37-39, 22:25-29, 23:27, 25:10-12). With this in mind, for someone as ‘zealous’ in the Jewish faith as Paul, it would not be at all strange for him to have a very good appreciation and familiarity with the Greek version of the scriptures; the Septuagint (LXX). Moreover, scholars are increasingly recognising the widespread use of this Greek translation within Second Temple Israel. The significance of the numerous allusions that Paul makes to this collection is that it helps us to understand some of the ideas, concepts and influences on his theology and ethics. It helps us to root the birth of Christianity and the first (surviving) written expressions of it, even more firmly within the Jewish religious world of the Roman period. The following wordcloud displays all the books from the Apocrypha alluded to in Paul’s writings. The size of the names represents the frequency of allusions made to them (the largest = most frequent). Once again, the calculations are based upon Appendix IV in Novum Testamentum Graece 27th edn. Please note, that Jubilees (a midrashic commentary on Genesis and part of Exodus) appears twice. It is not part of the deuterocanon and has been included in this wordcloud erroneously. See the pseudepigrapha wordcloud below for its correct inclusion. Bearing in mind Paul’s theology and his mission, as with his use of the Tanakh, it is not particularly surprising to find that he makes the most allusions (by a very long margin) to the Wisdom of Solomon. Thought to have been written in Greek by a Hellenistic Jew, sometime between 50 and 30 B.C.E., the Wisdom of Solomon comprises a fusion of Greek and Jewish ideas. Although it reflects a wide range of Greek literature and philosophy (including Homer, Plato and Pythagoras), Nigosian (2004: 203) can nevertheless describe it as being ‘profoundly Jewish.’ The Wisdom of Solomon shares with Paul an inclusive theology in which God is concerned with all human beings (including those outside the Jewish nation) and is universally active. It also explicitly develops the idea of immortality. Importantly, immortality is expressed here as being a gift from God to the righteous, rather than being an inherent quality of the human soul (as in Greek thought). Sirach (also known as the Wisdom of Ben Sira, the Wisdom of Jesus, the son of Sirach, or Ecclesiasticus) is the next most frequently alluded to work in Paul’s letters. Written by Joshua ben Sira (Sir. 50:27), its prologue (found in the Septuagint tradition) was written by his grandson around 132 B.C.E.. This dates the main text to approximately 180 B.C.E. (see Nigosian, 2004: 204-205). As with the Wisdom of Solomon, Sirach also encompasses both Hebrew and Hellenistic worlds, as well as sharing its emphasis on the place of wisdom within national and religious life. Originally written in Hebrew and predominantly based in Palestine, the author appears to have travelled widely (including Egypt, prol.) and his writings reflect his experiences. The book appears to have been widely circulated during the intertestamental period with copies being found Cairo, Qumran and Masada. Topics are wide ranging and have the rather eclectic feel of Proverbs. One dominant theme is nature or the creation, and includes a poem in praise of the acts of God within nature (Sir. 42:15-43:33). Nigosian (2004:205) observes within it parallel passages from Job and Psalms. 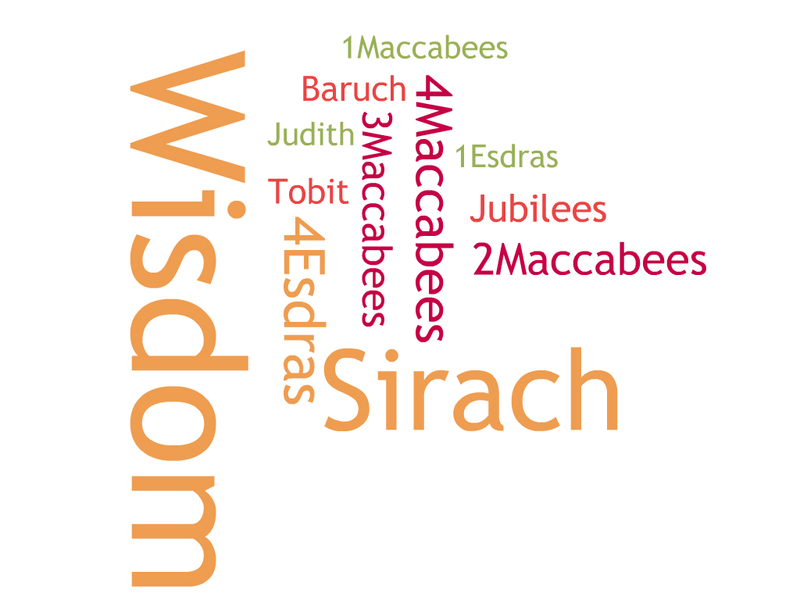 Sirach also shares the notion that one can gain wisdom from close observation of the natural world, which appears to be developing within wider Jewish thought at this time (see earlier post on Proverbs: Verse of the Month). This concept can also be seen in some of Paul’s teaching (for example, Romans 1:19-20; 1 Corinthians 11:14). Those of you more familiar with apocryphal writings will notice an apparent anomaly – some of the works appearing in the wordcloud (and in the NA27 list) are thought to have been written sometime after Paul – at least in their present form. For example, 4 Esdras is pretty well unanimously believed to have been written following (and as a response to) the destruction of the temple in 70 C.E.. This points to the problems of identifying allusions and parallels and satisfactorily establishing literary relationships. This problem becomes even more pronounced when we look at allusions to wider pseudepigraphic writings from the intertestamental period. These are works written at a similar time to the apocryphal writings, but were not included in the Septuagint. Like 4 Esdras, the Apocalypse of Baruch is also thought to have been written as a response to the devastation of 70 C.E. (although attributed to Baruch ben Neriah who lived during the 6th cent B.C.E.). Consequently we need to be careful in deciding actual instances of allusions attributed to Paul’s use of other literature. Nevertheless, studying these similarities is still worthwhile. It gives us an idea of the shared language (phrases, idioms and locution) between this disparate groups. These works derive from the same world, often sharing common ideas and perceptions of the mundane as well as divine. Although following 70 C.E. the paths of Judaism and Christianity become evermore divergent, there are nevertheless identifiable commonalities in language and developments of thought. The Psalms of Solomon also seemed to have wide appeal and have been dated to between roughly 80 and 30 B.C.E. (see, Docherty, 2014:69). Highly critical of the political and religious élite, they place a strong emphasis on piety and the law, and have been associated with both the Pharisaical party and the Essenes (see discussion in: Docherty, 2014:70). Which of Paul’s letters contain most allusions? By far, the most allusions are found in Paul’s letter to the Romans with a total of 76 instances. The Wisdom of Solomon is particularly prominent, especially within the first few chapters – perhaps reflecting their shared belief that wisdom (and the divine) can be learnt through an observation of creation. In the first chapter it has been claimed that there are ten intertestamental allusions. The next letter is 1 Corinthians with 27 – although 2 Corinthians is purported to contain only 4. It is probably not unexpected that the only letter to contain no allusions is Philemon. It might also be significant that the disputed and Pastoral letters tend to have far fewer instances, perhaps indicating a greater distance between Christian thought and language, and non-canonical Jewish literature. Trinity College (University of Toronto) have a helpful gateway to four sites where you will find the texts to all the works listed above (including one that contains Christian apocryphal writings). Unfortunately a number of the translations are very old, but they will nevertheless give you a good taste of their range and content. The SBL’s Online Critical Pseudepigrapha offers a very useful tool for those wanting to engage at a deeper level. You’re very welcome Dr. Goode! Thanks, Doug, you’re absolutely right, Jubilees shouldn’t be in the first cloud. I’d initially created a word cloud featuring all the books but felt it could be mis-representative and so divided the data sets into deuterocanonical and (broadly) pseudepigraphic. Jubilees inadvertently got copied into both! Thanks Geoff – now that was just going to happen and it just had to be one of the headings hahaha!